In small groups, they re-entered the church. Tired and a bit dirty, but with smiles on their faces, they swapped stories of ripping down soggy drywall, pulling up saturated carpet and hauling out furniture made extra heavy by materials that retained water. They are early response team (ERT) members of the Great Plains Conference, people trained to swoop in after a natural disaster to start the earliest stages of the recovery process. Wednesday, March 20, the base they were returning to was North Loup United Methodist Church. On any other weekday, this more than 125-year-old structure positioned on a road through a small town about an hour’s drive northwest of Grand Island would sit quietly. But on this day its basement bustled with activity as volunteers checked in after completing one task to grab a fresh bottle of water before heading out to help another family impacted by floodwaters. “We’re called as Christians to get out and help, and we need to get up and go,” said Robilea Swindell, who traveled to central Nebraska from First United Methodist Church in Lawrence, Kansas. Swindell is one of the veterans of the early response team in North Loup. She said she and her husband were weighing options on what to do during their retirement years when they assisted on a disaster response mission trip to Bay St. Louis, Mississippi, after a hurricane. Another disaster response veteran, Larry Viterna from Louisburg United Methodist Church in Kansas, traveled 424 miles to help. He started with the early response team because he wanted to help people in Joplin, Missouri, a border town devastated by a tornado May 22, 2011. He made seven trips to Joplin to help with cleanup and rebuilding efforts. Since then, he has been dedicated to helping others recover from disasters. “I do it because I can. As long as I can, I want to help,” he said. The Rev. Hollie Tapley, disaster response coordinator for the conference, said she greatly appreciated the ERT members and local residents who showed up to help. “We’ve made some new friends during our time here,” she said Thursday. Tapley said disaster response is more than just physical labor. She said the ERT members recall regularly the passage from Matthew 9:35-36, where Jesus looks upon the downtrodden with compassion. “This is one way to show we are Christians and that we love people, by serving as the hands and feet of Christ with people who have been faced with a disaster,” Tapley said. While much of the media focus to date has been on flooding in the eastern part of Nebraska, this rural region of central Nebraska was hit hard by the heavy rains and rising waters of the North Loup River and its surrounding creeks. Frozen ground from the bitter cold and snow in weeks prior to the rains left the water nowhere to go but across farm fields and into people’s homes. Even after several days with no precipitation, warmer temperatures and a little sunshine, county crews Wednesday and Thursday used the buckets of large excavators to break up huge ice blocks near bridges southeast of town. Water sitting on the ground made farm fields between St. Paul and North Loup along State Highway 11 look more like lakes suitable for fishing than ground that should be ready for the annual planting just days or weeks from now. The rising waters cut off some roads, and in town, that water started settling into basements. “The drywall gets wet, and the insulation behind it gets wet, and then you get black mold growing,” Burrell Albee of First United Methodist Church of Ogallala, Nebraska, said in describing the kind of damage he assessed in North Loup. Albee said it’s lucky that the water didn’t get very deep in this community. As a result, he and others were able to remove just the bottom four feet of dry wall and insulation and haul it to the dump. That saves homeowners money as they try to restore their homes. 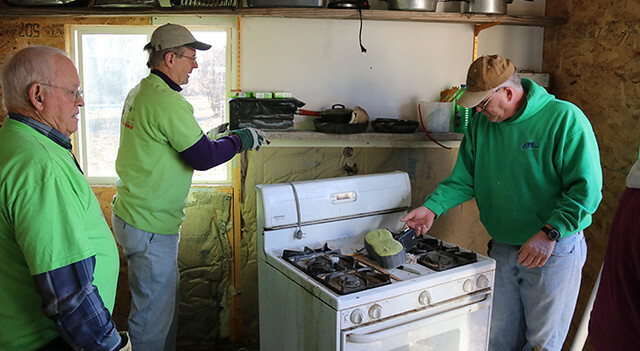 A volunteer helps clean destroyed items from a house in North Loup, Nebraska. The North Loup flood was the first ERT experience for Albee after retiring from 45 years as a pharmacist. He said he saw helping after disasters as a way of putting some of the other skills he had learned throughout his life to work while showing the love of Christ. “I’m pretty handy, so I can build walls, or take out dry wall, or hang dry wall or paint,” he said. Jean Carder from Louisburg was another first-time ERT volunteer in North Loup. She took ERT training in 2017, and a recent change in jobs allowed for more flexibility with her schedule. She said her first day as an ERT volunteer gave her an opportunity to meet new people while helping others. It’s an opportunity to show people devastated by a disaster that they are loved. “When I’m old and I have a disaster, I hope somebody comes and helps me,” she said. Heath Birchell is far from old. In fact, he has a young son who likes Dad to lay down with him when it’s bedtime. But his duties as a firefighter prevented him from being able to defend his home from rising waters. That day, he and colleagues worked with the local co-op to use a loader to help a mother and children escape rapidly rising water. “I was doing what I was supposed to do,” Birchell said. Normally split into smaller teams, ERT members found themselves Thursday morning as a large group at Birchell’s residence on the north end of town. Water rose to almost 5 feet high in his basement, so the ERT members set up a bucket brigade to move the muck up the stairs and out the back door, where it was walked across the squishy grass and dumped under trees. Once the team completed that task, it moved on to a garage, where the small army dressed in the ERT-identifying green T-shirts made quick work of removing wet dry wall and emptying water from everything from Rubbermaid containers to boxes to a baggie filled with Christmas tic-tac-toe pieces. Birchell said he appreciated the assistance, particularly because he was still recovering from shoulder surgery and wouldn’t have been able to have done as much as the team could accomplish in such a short amount of time — less than three hours. ERT members do so out of conviction of serving others in the name of Christ. They pay their own way — gasoline to travel hundreds of miles, food along the way, and the standard uniform pieces for this kind of work: gloves, boots, safety glasses and, yes, those masks. The latter is an essential piece of safety equipment, but they can be uncomfortable and can make a person hot quickly. Back in the church basement, a quick comment by Carder about the discomfort from wearing the mask receives nearly universal agreement from the volunteers as they finally relaxed around tables in the church basement. Air mattresses fill the floors, with three or more people sleeping in each room. She baked homemade cinnamon rolls and has tried to provide as much comfort as possible for the people donating their time and talents. And she has received a little help along the way. Local radio stations and the nearby Ord Chamber of Commerce donated pallets of water. The Ord and Scotia UMCs provided sandwiches for the ERT members’ lunches, as did the local Subway restaurant. Members of Greeley UMC brought in juices and milk. Evening meals for volunteers are being hosted by Greeley UMC and area Catholics one night and Zion Lutheran Church in Scotia another night. Schools in the region also have offered to provide food and have opened their doors to volunteers so they can shower. The community outpouring has been important, Brock said. She is appreciative of the efforts of the ERT volunteers and the expertise they bring. “They have the products and skills and knowledge,” Brock said of the conference’s response teams. “They are going in and looking at people’s basements. If they need water taken out, they are doing that. If they need dry wall removed, or carpet removed, they are doing that. And they are spraying something to kill mold. And it’s all free. Brock said the disaster response effort shows what the United Methodist system can do in a time of crisis. Brock paused for a few minutes Wednesday. Since the previous Friday, when the waters receded enough to allow cars to venture back into town, she has been providing pastoral care to people with damaged homes and has been meeting people who are not part of her church but who now are being helped through the conference’s disaster response effort. She doesn’t complain, but the look on her face shows a chance for a few moments of rest is welcome. Seated in the North Loup UMC sanctuary, light shines through the tall, colorful stained-glass windows. The rays of sun provide a metaphor for brighter days ahead as a result, in large part, of the efforts of the early response teams. “We’ve been blessed so much by what God has provided through everybody,” Brock said.